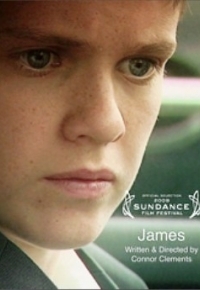 James (Niall Wright) -- lonely, young, miserable, and gay -- craves the acceptance of his English teacher, Mr. Sutherland, but Mr. Sutherland's discomfort with James' sexuality may spell disaster for the solitary young man. I watched this short on Youtube, and found it to be a very watchable and moving experience. Niall Wright was very strong in the lead role ... where did they find this kid? The script was tightly written and never far-fetched- myriad tragedies befall James, and all of them seem believable. James seems like a smart and sensible boy prone to occasional bad choices, and I immediately liked and empathized with him. I don't think I've ever liked the character in a short film more. There were some technical troubles which seem unavoidable when making a first film. The color scheme is 'off.' There is a fight scene where the blows aren't well-coordinated, so what was originally intended to be vicious kicks are reduced to gentle toe-taps. Despite the errors in the filmmaking process, I see no fault with the script. Everyone who is interested in the well-being of children, gay or straight, should watch this movie. Just prepare for a realistic and sad approach, with no pat conclusions. Thanks for sharing this! I plan on checking it out when I get some time to myself.